Grab - Jesus Luzardo (#230 overall, high - 153/low - 371) - Don't count on Luzardo lasting until Round 20 in your draft. His hype train has gained a lot of passengers in the past few weeks. In fact, since the start of March, Luzardo is usually going about 3-4 rounds before this point. Entering Sunday, the southpaw has only fired 5.2 innings in Arizona, but he's featured 10 whiffs and no earned runs in that run of work. The long-term love affair stems from a fastball-change-curve, 3-pitch mix that is refined, strong, and ready to play. He's unlikely to begin the year in the Oakland rotation, but I would assume his arrival by late-May and he's a good bet to be one of the top two-to-three rookie hurlers in baseball this year. Pass - Jorge Alfaro (237, 159/339) - Alfaro will get a lot of playing time, but is it playing time that you will want? The new Marlin (who was acquired in the J.T. Realmuto deal with Philadelphia) has a prototypical 2019 approach ... raw power with a heaping helping of swing-and-miss. The swing-and-miss will stay around this year (expect 130-150 whiffs in less than 130 games), but power just does not play at Marlins Park. Alfaro MUST get you 20 homers to pay off because his other four categories won't lift you at all. I don't think he gets to 20, so I don't think he pays off at this investment level. Talk to me five rounds from now. Grab - Domingo Santana (247, 129/519) - It's doubtful that any player who maintained health last year turned in a larger performance drop from '17 to '18. Santana got caught up in the numbers game in Milwaukee's outfield and only snagged 211 at-bats ... just one year after going 30/15 with 85 RBIs. Things were so quiet at the bigs that Santana spent a third of the season bussing around the minors. The Brewers showed mercy in the offseason and sent him over to Seattle. That means ... playing time! Santana joins a team that embraces the running game and he arrives in a lineup that needs him to drive in runs. Expect to see him in the middle of the order, posting another 20+ HRs with double-digit SBs and 75+ RBIs. Pass - Gregory Polanco (248, 124/391) - A usually-underwhelming player is now coming off of a major shoulder surgery. Oh, and he's likely out until June. No thanks. Grab - Trevor May (260, 159/404) - May (Tommy John surgery) didn't return to a major league mound until the second-half of last season. Upon his arrival to the Twin bullpen, we saw a guy still sporting nice velocity (94+), a 7:1 K:BB rate, earning four wins and four saves ... all in just over 25 innings of work. Blake Parker (375, 196/678) is a lot cheaper according to ADP, but don't be caught off-guard if he goes before May in your draft. That's because the Twins could name Parker as their early-season closer. Even if that plan happens to stick for a bit, I feel that eventually May will take over. You'll still be able to rack up some excellent RP3 ratios while you wait for that to happen. Pass - Kyle Seager (256, 139/353) - This pains me to type. Seager has been one of my overlooked favorites for the last half-decade. But, things just crashed a bit too much for me last year. A jambalaya mix of turning 31, more K's, fewer walks, a never-gonna-top-.250-batting-average approach, and a stacked 3B position (Seager is going 25th at the hot corner) has me 'out' for the first time ever on the vet. Grab - Kyle Tucker (266, 162/380) - Let's hope everyone in your league sees Tucker's 64 MLB at-bats last year and ignores him The kid hit .141, with twice as many whiffs as walks, and failed to launch a single home run. Don't pay attention to any of that. Instead, you should lock-in on his 1.200+ OPS with 12 HRs and eight SBs in 30 games at AAA. Tucker has been an upper-end prospect for a couple of years and can be a .275/20/10+ player for years to come. Draft and stash is the plan here ... Tucker should move into the starting 9 with either an early-year injury or by the calendar flip to June. Pass - Shane Greene (267, 117/504) - Greene is the poster child for those who argue how meaningless saves can be. The washed-up starter did register 32 saves last season, but getting there was a massive chore. How about 32 saves ... with a 5.00+ ERA?? How about 32 saves ... with a 1.37 WHIP?? How about 32 saves ... with RHBs posting a .352 wOBA?? I suppose if you totally ignore the bullpen early in your draft and you just need a cheap source of saves, then Greene is ... OK?? If you already have two RPs, it's highly recommended that you don't blow up your ratio's with this RP3. I'd rather get five saves with a 2.50 ERA, a sub-1.10 WHIP, and 10 K/9 from a high-end, high-leverage RP then deal with Greene's headaches. 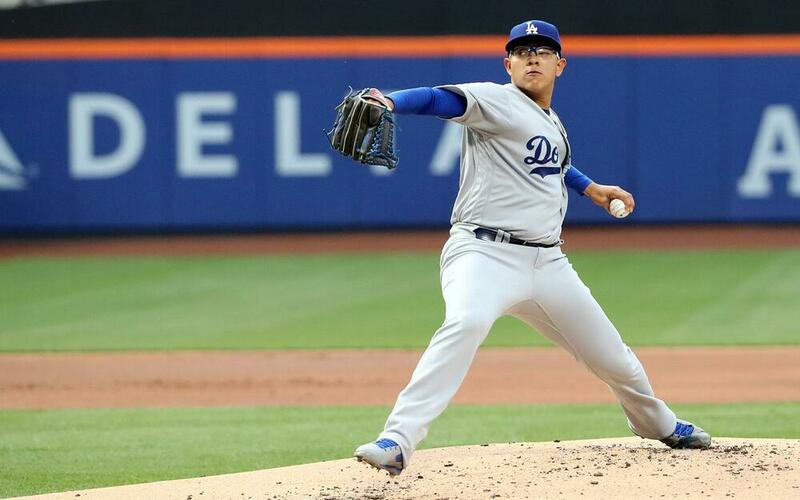 Grab - Julio Urias (278, 137/397) - The West Coast-version of Alex Reyes (195, 71/344) has just about the same upside, same outlook, and same concerns (limited innings) ... at a draft cost of 80 picks later. Urias is probably going to spend a majority of his time emerging from the bullpen, but I love the idea of being able to pick-and-choose his starts and appearances throughout the year. Of course, that requires in-season management. If you're not willing to put in the time, don't draft the guy. If you do accept the challenge I think you'll end up with 120-130 innings of strong ratios. There are very few SP arms (even half-season SP arms) like Urias found this late in draft. Pass - Dylan Bundy (286, 172/395) - Let's all agree that he can't be as utterly awful as a year ago. After all, nobody gives up 41 HRs in back-to-back years. But, hurlers who call Camden Yards home ... who have fly-ball tendencies ... who pitch for 100-loss franchises ... and, who don't exhibit great velocity (around 91 mph on average), don't entice me for turnarounds. There's just so little upside here. He's justa guy. Grab - Dellin Betances (290, 164/420) - When I was talking about bypassing Shane Greene earlier and targeting high-ratio RPs instead ... I was talking about a guy like Betances. He's one of the most consistently good relievers that we have seen in baseball over the past decade. In 350 appearances over five years (70 trips to the mound a season), Betances has a 2.22 ERA, a 1.02 WHIP, and a 14.6 K/9. He'll also toss in a handful of saves. What's not to like? Pass - Austin Hedges (293, 158/388) - A mostly-nothing, blah catcher who will probably be platooning all year with Francisco Mejia (251, 157/357)?? Pass. Grab - Jeff McNeil (309, 143/444) - McNeil is a must-snag late-round pick in leagues where you are able to make daily changes to your starting lineup. He's going to be jumping all over the diamond for the Mets in '19 and no matter where he's at or which day of the week it is, McNeil is a guy who puts bat-to-ball, runs, and can even tack on low double-digit homers. It's not going to be anything incredibly special, but a simple .275 average with 15+ steals makes this soon-to-be fan favorite a total bargain this late. Pass - Michael Fulmer (304, 227/417) - Fulmer's early spring returns have been rough. And I'm not talking about only the seven earned runs and 11 hits allowed in eight frames. No, the real issue here is that Fulmer hasn't found his fastball. He's been in the 80s most of the time. His usual marks? Over 95! His results and injuries have been a concern for well over a year, as is, but, I'm totally out when you pile on velocity struggles. Grab - Greg Allen (317, 199/423) - Here's a fashionable late-flier on stolen bases. Allen isn't necessarily a starter in the Cleveland outfield, but are even the actual starters in Cleveland's outfield ... really starters?? I'd say no. I'm not a huge overall fan of Allen, but I think that a simple amount of playing time will lead to over 20 thefts. Think of him as a younger version of former-Cleveland burner, Rajai Davis. Pass - Starlin Castro (312, 228/414) - I wrote about Castro a couple of weeks back. Castro just has no lift-off to his game. Everything is ordinary and you can probably call it 'less-than-ordinary' when it occurs with the Miami Marlins. If you have injuries, he would be a decent enough fill-in. But, I'd rather go young or take aim at a player with one elite talent then to settle for Castro on draft day. After all, if you ever need a guy like him in-season, a guy like him is ALWAYS available on the waiver wire. Grab - Avisail Garcia (335, 185/488) - Earlier, I brought up the case of Domingo Santana. He disappointed last season without the excuse of injury. Garcia is on the opposite side of the coin. An early season hamstring injury was closely followed by a mid-year knee injury and Garcia seemed limited for a good 80% of the season. Chicago wasn't interested in waiting for the turnaround, so now he gets his chance in Tampa. It's the perfect spot to rebound. He'll never top his epic '17, but I'm fine with penciling down a .250/.310/.440 slash with a 20 HR target. That's nothing special, but it's still very worthy in the 28th round. Pass - Adam Jones (324, 211/440) - Here we are in mid-March and no one wants Jones ... well, scratch that! As I type, reports are saying he's joining Arizona. And, that he will be their Center-Fielder. And, that ... well, he'll probably beg, plead, and steal to get his OPS back up to .750 (it stood at .732 last year). He's a great guy and can help out anyone in the clubhouse, but for fantasy purposes, even this late-spring signing doesn't do much for me. League changes at this late point in a career are worrisome and as he enters his age-33 season, he's just been regressing for too long now. Grab - Kelvin Herrera (345, 169/600) - Herrera has landed on the South Side of Chicago and it's the perfect spot for him to rack up holds, ratio's, and late-season saves. Again, if you wait and wait on relievers, Herrera is an absolute target late. No one would be shocked to see 20 saves from him. The ratios won't be special, but they can be solid. Pass - Matt Harvey (346, 365/478) - The former-'Future Hall of Famer' had to save his career last season in ... Cincinnati. Give credit where credit is due. Harvey survived and convinced the Angels to give him a shot. For the record, there was nothing that was 'old school' Harvey with the Reds. Anyone fired up about a 4.50 ERA with a 1.25 WHIP and few strikeouts?? You shouldn't be. Putting him on this list is a little rough, I admit. The main point that I'm trying to make is that Harvey '19 IS NOT CLOSE to Harvey '13. Just know that you're getting an average pitcher and you should cut him and move on if it isn't working by May 1.